The day is coming, you know it is. The day your refrigeration system cranks, sputters, coughs and lurches to a screeching halt for the last time or you’re looking to upgrade versus another overhaul. It could be poor brine chemistry, lack of consistent maintenance, R22 is being phased out, or the local municipality no longer accepting the hazards of an aging and potentially hazardous ammonia system. Regardless of the reason, when the contractor is speaking of six or seven figure pricing and significant downtime to replace the 25 year old refrigeration plant, not many are excited to approach the town or school board with the bad news. Installing the ice3 Cubes buys a facility more than utility savings and a budget-friendly upgrade path. The ice3 Cubes offers facility flexibility. Flexibility is often overlooked but is so important when a facility needs to expand to off-season uses or extend their season to year-round ice. An industrial plant is one size and therefore restricted to its pre-set limitations. Beyond consistently lower maintenance and utility costs, the ice3 Cubes have a major benefit down the road when a facility’s refrigeration system inevitably ages beyond twenty-five years old. Chillers such as ice3 Cubes have an unexpected benefit in that they are modular. Each module ice3 Cube is a stand-alone chiller with its own refrigerant circuit and Digital Control modules. These smaller modular chillers provide for smaller refrigerant charges and more stages of redundancy to provide the larger capacity needed as determined by the facility size and requirements. In a nutshell, you run only the refrigeration you need (or expand the size of your capacity in small increments as needs arise due to facility changes like expansion or use). Ice3 Cube’s technology allows a much more palatable and budget friendly future replacement option because the ice3 Cubes are modular. This means as few as one or two ice3 Cubes can be replaced at a time while the remaining Cubes maintain the ice sheet. 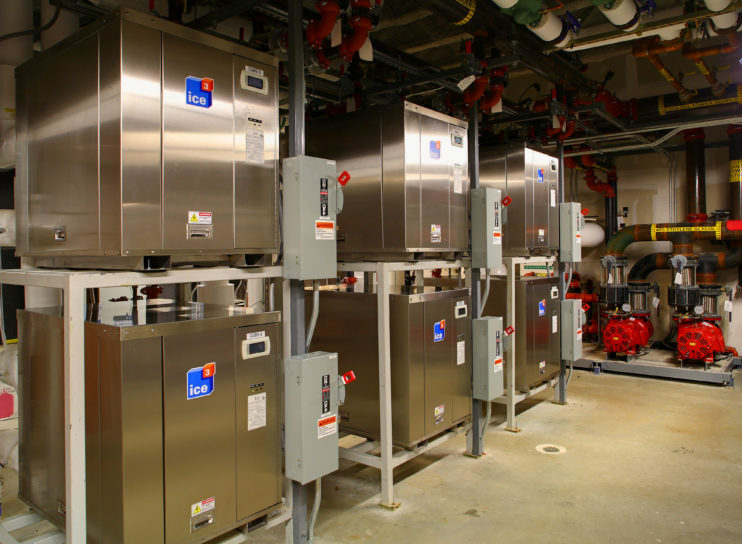 Newer technologies can be installed as a plug-and-play option at a fraction of replacing an entire refrigeration plant. This can be a phased upgrade over several years allowing the facility to treat the refrigeration plant replacement as minor capital improvements and costs. Having the foresight to look toward the future is important in any industry. Emerald Environmental Technologies has installed hundreds of Cubes in facilities across the east coast. We have seen facilities having to upgrade to a multi-season or extended-season arena to stay competitive or meet budget needs but they’re limited by their refrigeration system. Emerald has developed infrastructure for pumping capacity on speed drives, adequate sized piping and a cooling tower for future growth needs. When future changes require additional capacity, it is a simple case of adding more ice3 Cubes because the infrastructure was incorporated from the beginning. The infrastructure is installed in present monies at a fraction of the cost should expansion be needed in the future. University of New England (UNE) is a prime example of including future growth expectations into their initial construction budget. As an upgrade to their newer athletic center, UNE required summer ice and the ability to have AC in the gym year round. The refrigeration system was expanded with the addition of ice3 Cube #7, added over a three day period without skipping a beat. Deerfield Academy knew one day their ice arena, “The Barn”, would need to be demolished and their new facility built. When that day came, their existing ice3 Cubes were brought back to our New Hampshire factory to be refurbished. The controls were upgraded allowing a larger capacity refrigeration plant and AC for the new facility. The pre-existing four ice3 Cubes now run alongside six new ice3 Cubes and it is almost impossible to tell old from new. Plug and Play is a wise choice for the uncertain future where flexibility for growth is priceless. The expert team at Emerald Environmental Technologies can help define and customize which ice3 Cube combinations are ideal for your community/municipal/outdoor, upgrade project, or collegiate rink. Emerald Environmental Technologies is based in New England and services the entire east coast up through Canada. Please contact us today to request a free consultation. Email or call 603-238-9249 with questions.